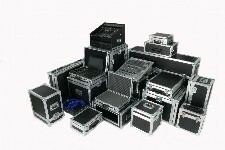 Buster cases was first established in 1991, handbuilding specialist, one off custom flight cases, and has had an ever increasing reputation for quality and price (see our client base for details). Recently, to run alongside all our custom work, a new range of flightcases has been developed which we call the ''2000 Series''. Mainly available in specific dimensions . As you would expect, our legendary build quality has not been compromised. NB* The cases described in the following sections, are only a small sample of some of our more popular lines. We are capable of making virtually any case for whatever use you wish to put them to. Remember, we are only a short phonecall away, or you can contact us by fax or email, and we will be more than happy to fulfill your requirements. All our flight cases are made from a Scandinavian (Finnish) mulit-laminate birch plywood. This makes the cases very strong, but at the same time it is considevably lighter than most other plywoods used in flight case production. Internally the board has a smooth, glossy black phenolic finish, and the outside surface has a slightly raised hexagonal design which is extra tough, and will help keep its looks for a long long time.